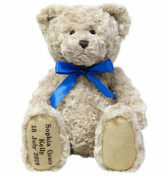 These soft and cuddly teddy bears are the perfect personalised Christmas present! 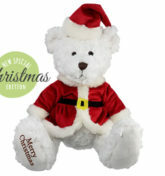 Whether you want to say “Happy Christmas”, “Seasons Greetings” or “I Love You” – these personalised Christmas teddy bears are real charmers. 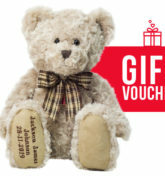 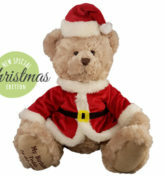 Personalised with either the recipient’s name and/or birth-date, with Merry Christmas or whatever message you choose embroidered onto the pad of the bear’s foot, the My Birthday Teddy bear comes with his own birth certificate as well! 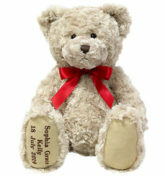 Standing approx. 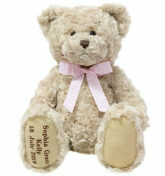 50cm tall, select from our range of traditional teddy with Brown checked or pink ribbon or a gorgeous blue or pink teddy.